Learn about your crowdfunding options and how to make your campaign a success. Most of us have heard about online crowdfunding, and many of us have even donated to an online crowdfunding campaign. There are plenty of reasons to use Crowdspire.org to raise money. First, we’ll share reasons to use Crowdspire.org, then we’ll discuss tips and features to help make your campaign successful. Create a Crowdspire.org Campaign for. . .
That’s right! It’s free to sign up for Crowdspire.org. You can create as many campaigns as you like, and there is no cost to sign up or create a campaign -- ever. It’s important to engage your audience by using concise, attention-grabbing headlines. Incorporating a call-to-action within your content and social media posts will help you generate more donation clicks on your campaign page. If you are creating an event page, be sure to include the date, time, and location of your event. One of the best features of Crowdspire.org is its social media integration. It’s one thing to start a campaign, but marketing is necessary for the success of your campaign. You can schedule social media blasts directly through Crowdspire.org. Conveniently share your campaign URL on social media for others to click and donate. 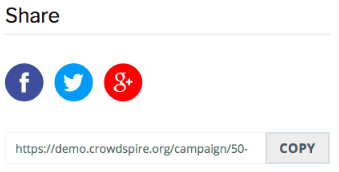 Your donors can copy your campaign URL to share on their social media platforms as well. Update your donors on your campaign page by sharing comments, photos, and videos regarding the status of your campaign progress. Give your donors something to look forward to while on the path to achieve your goal. Not only will they appreciate the updates, but they will be more likely to share your campaign with others. In the comparison chart below, you will clearly see that Crowdspire.org has the lowest fees when compared to other commonly known crowdfunding platforms. Why use a different crowdfunding platform when you can use Crowdspire.org and have more money go toward your campaign? Do you have an idea for a project? Would you like to raise funds for a cause you care about? Need to set up event registration? Whatever the occasion, create your FREE campaign today at Crowdspire.org! Or, contact Wildcard for more information, (715) 869-3440 ext. 105.